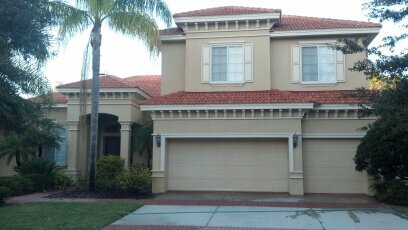 Monier Life Tile roof cleaning completed by our professional crew. Some of these tiles were completely covered with roof algae. The roof has not been cleaned since the home was built six years ago. The Peerless Punch solution restored the original colors. The Peerless Punch roof cleaning solution has been approved by a major roofing material manufacturer. Our solution was tested by the manufacturers of the materials used for the Van Wezel Performing Arts Roof Cleaning Historical Building. The solution is applied using custom to our specifications pumps. 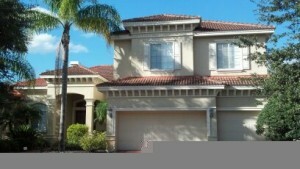 Our pumps are designed just for roof cleaning Bradenton type systems. We utilize our high performance pumps and hoses to keep us off of your delicate tiles. A Peerless roof cleaner can reduce the amount of walking upon your tiles by as much as 80%, in some case ZERO walking at all. Your roof is infected with a cyanobacteria named Gloeocapsa Magma. This algae spreads by spores and seeks the crushed limestone used during the manufacturing of the tiles. Usually you will first see the mold on the north side of your home or where the most moisture is allowed to thrive. The algae must be killed 100% to achieve the longest lasting cleaning. Pressure washing your Bradenton roof will only temporarily remove the stains you can see. The spores will be spread during the high pressure blasting and the algae will return thicker and very quickly. 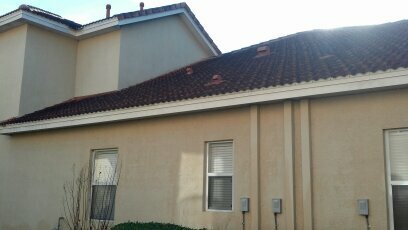 Typically a roof cleaned with our system lasts 2 to 4 times longer than pressure washing. That reduces the traffic and risks on your tiles dramatically. The Peerless Punch is applied and left on your tiles, breaking down to a preventative film against algae spores. Will My Plants and Grass Be Harmed? With proper preventative measures the answer is no. The solution is designed to kill a type of plant living on your Bradenton roof. Just like how painters prepare and cover for over-spray, Peerless Pressure Washing Inc. will take preventative measures to protect your plants. Our crew consists of one solution applicator and a dedicated ground-man protecting your plants. Our owner Tom Peerless is on every job also over-seeing the roof cleaning with over 10 years experience cleaning over 18,000 roofs. 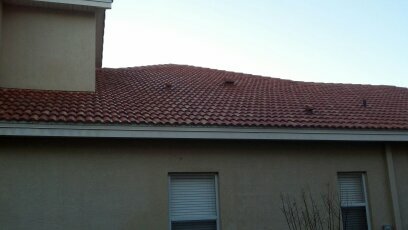 All of our roof cleaning Bradenton customers receive a 1 year spot free warranty. There is no pro – rated fine print with maintenance cleanings that come with 5 year warranties. Peerless roof cleaners do however offer a lifetime maintenance program to keep your clean roof clean. Once you have had your first major cleaning with us, we then can offer you a reduced price maintenance cleaning.